This is a sample layout prepared for a catamaran with a 24 volt electrical system. Victron make a number of 24 volt Lithium batteries. This installation can use either the 180 Amp hour Lithium Battery or any of the Lithium HE batteries. This type of installation gets used in the most heavy duty applications. It uses the Lynx Ion BMS which has integrated circuit protection for the battery side and the load side and an integrated amp hour monitor which uses the Color Control GX as its display. The four batteries are monitored and controlled by the BMS and have a VE Can data cable network to do the monitoring. The BMS acts as an energy monitor and displays the results on the screen of the Color Control GX. The Quattro or MultiPlus is used for shore or generator charging and as an inverter. 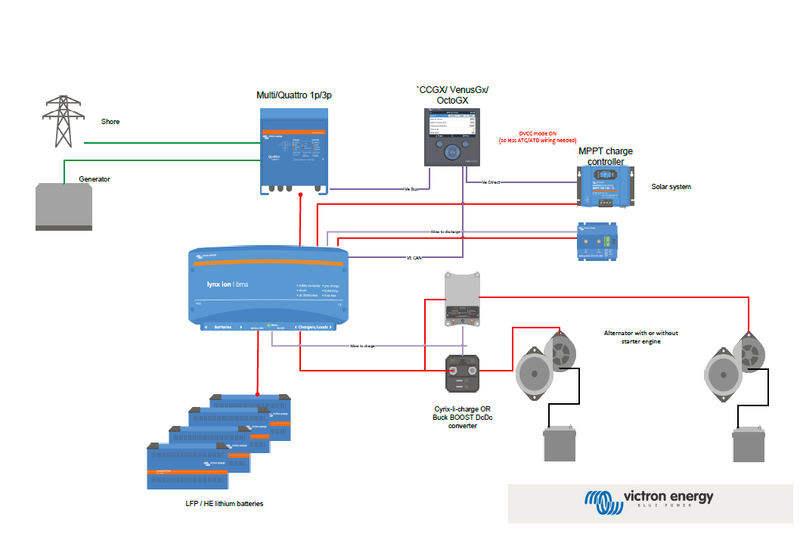 The solar charge controller is also linked to the network to control charging of the batteries. This diagram shows two alternative ways of connecting the alternators, in one it is using a Buck Boost DC DC Converter as the interface between the alternator and the battery. This offers the most control, can limit the draw on the alternator and modify the voltage to match the requirements of the batteries. The other way is a simpler combiner which links the start and house batteries and which is controlled by the BMS. At the time of writing (February 2018) Victron does not stock the HE Lithium batteries in the US. They are available but delivery time is around two months. The other batteries that work in this scenario are being discontinued but there are still lots left and they have had a price drop making them more appealing.